Despite potential perceived challenges, switching to an outside analytics partner is worth the effort. In particular, a multi-state hospital system has many compelling reasons to make the move. - State to state data variances can include different release schedules, varying code and data formats. - An in-house system will likely have challenges accurately reformatting and curating the collected data in a timely fashion, leading to errors and unreliable reporting. 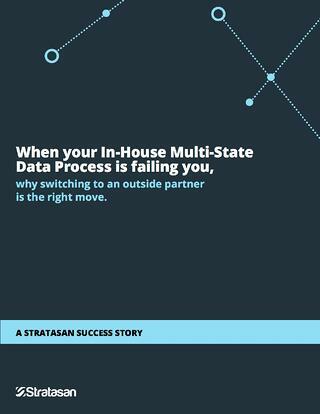 Aware of these issues and determined to find a better solution, one hospital system made the switch to Stratasan. As a result, they are now experiencing tremendous time and financial savings quarter over quarter, in addition to more effective strategic planning. If you find you are facing similar challenges, then it may be time to engage an outside partner who can streamline your process and set you up for success. Interested in learning more? Download this success story for a better idea of the opportunities you may be missing by sticking with the status quo.